Zoho People integrates with Zoho Payroll for an easy and error-free payroll processing experience. 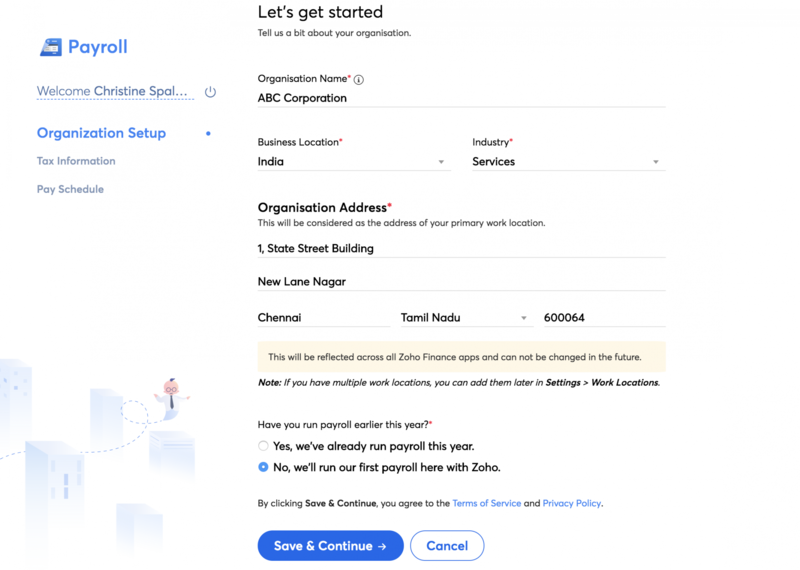 Zoho Payroll is available in India and automates all salary calculations, adheres to local laws and handles all statutory compliances. Organization Profile: Enter your organization and other important details. Select if you have already run payroll this year or if this is the first payroll you are running. Set your pay schedule with your pay frequency and pay date. Set up the statutory requirements such as Employee Provident Fund, Employee State Insurance, and Professional Tax. Select all the salary requirements that your organization offers to your employees. Navigate to Settings > Integrations > Zoho. 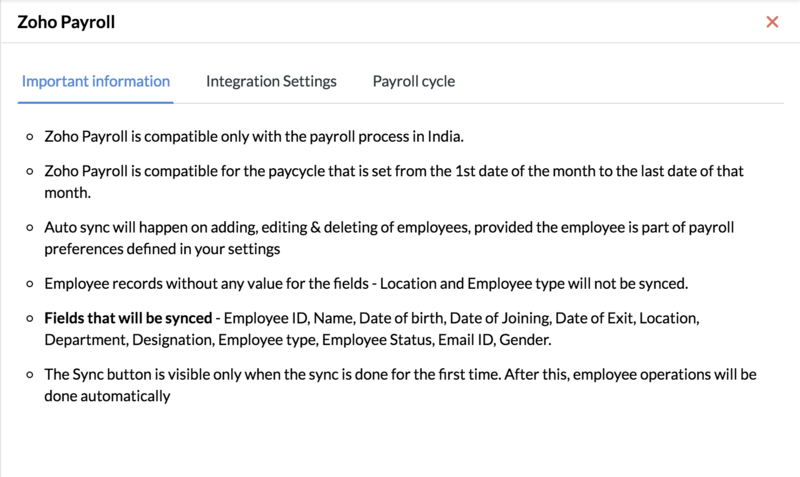 Click Configure under Zoho Payroll. Choose the organization for which you have setup Zoho Payroll. 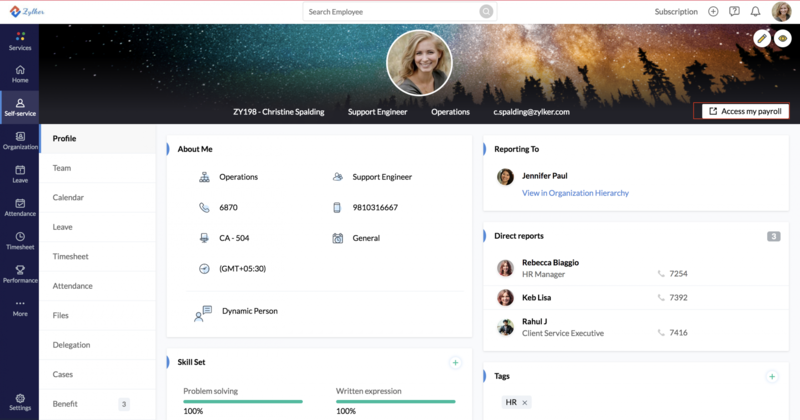 Zoho People's Super Administrator will become the default Payroll Admin. To change the Admin, click the edit (pencil) icon. Select the Location and Employee Type whose information you want to sync. 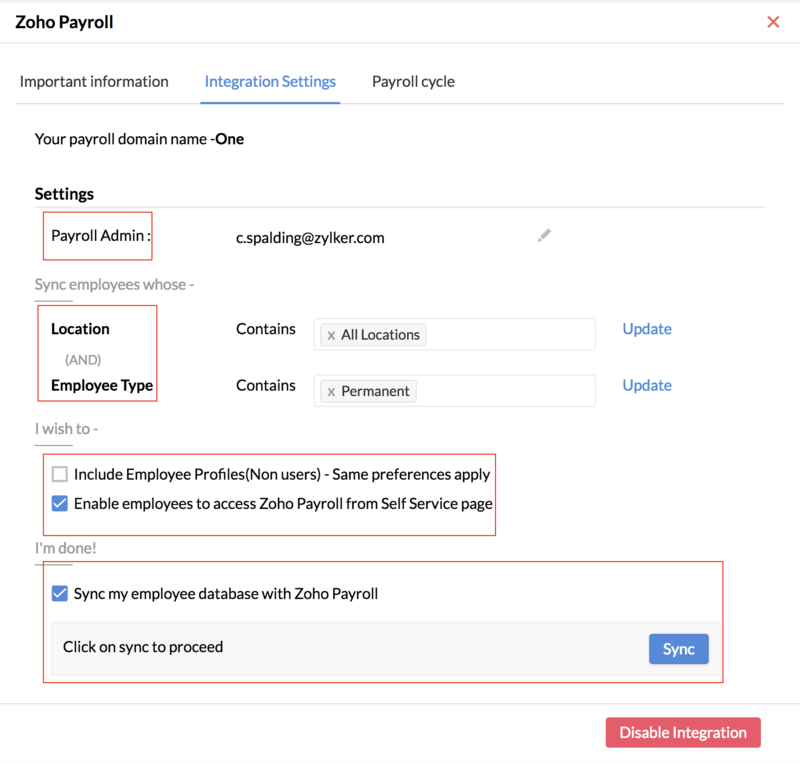 Select if you want to Include Employee Profiles and if you want to Enable employees to access Zoho Payroll from their Self-Service page. Select Sync my employee database with Zoho Payroll and click Sync. You will see a prompt; click Confirm to complete the sync. Note: Employee records without any value for the Location and Employee type fields will not be synchronized. Navigate to Settings > Integrations > Zoho Apps. Go to the Zoho People App. Click the edit (pencil) icon next to LOP Preference. Enable Allow LOP Sync from Zoho People. Select your Pay Schedule for which you want LOP synced. 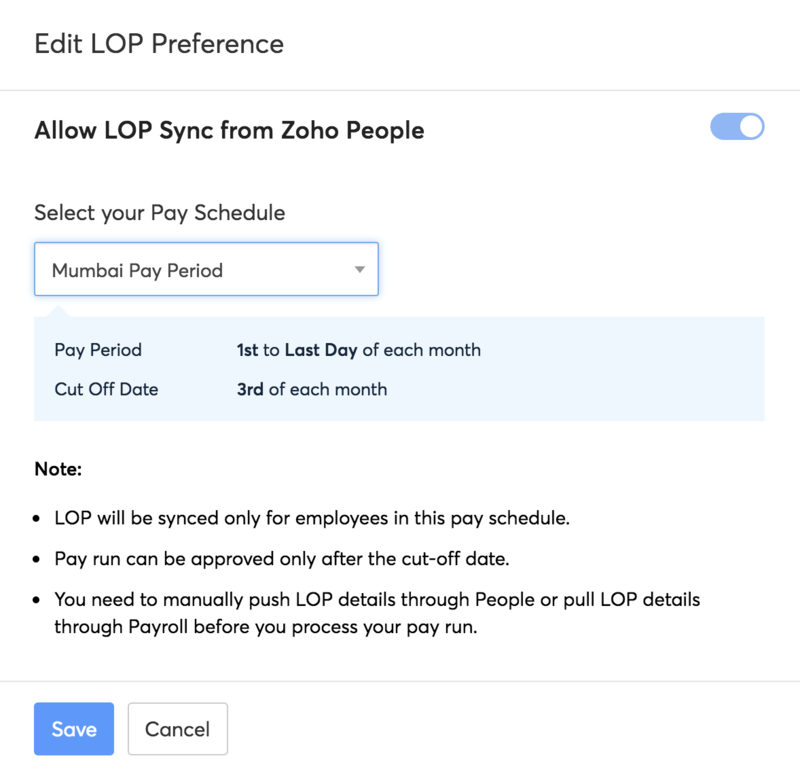 Once LOP Sync is enabled, you also need to create a Pay Run for LOP Data to be successfully pushed to Zoho Payroll. Navigate to Leave > Reports > LOP Reports. Click the ellipsis icon and select Push to Payroll. Go to Settings > Integrations > Zoho. 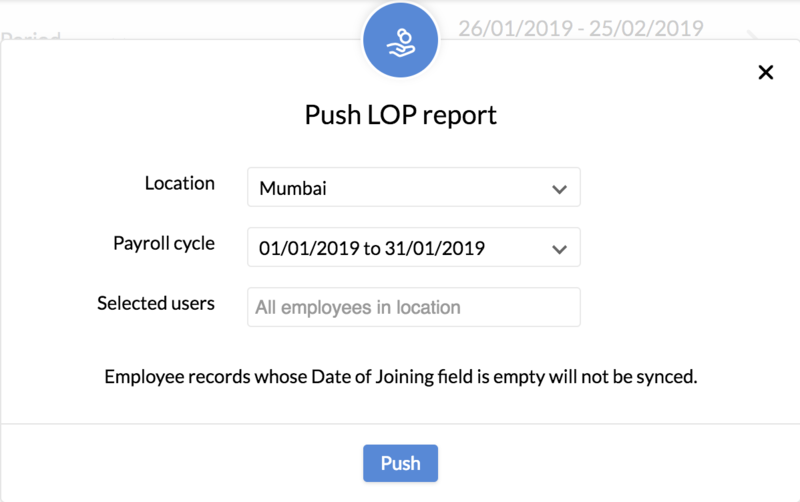 Click Show Details under Zoho Payroll. 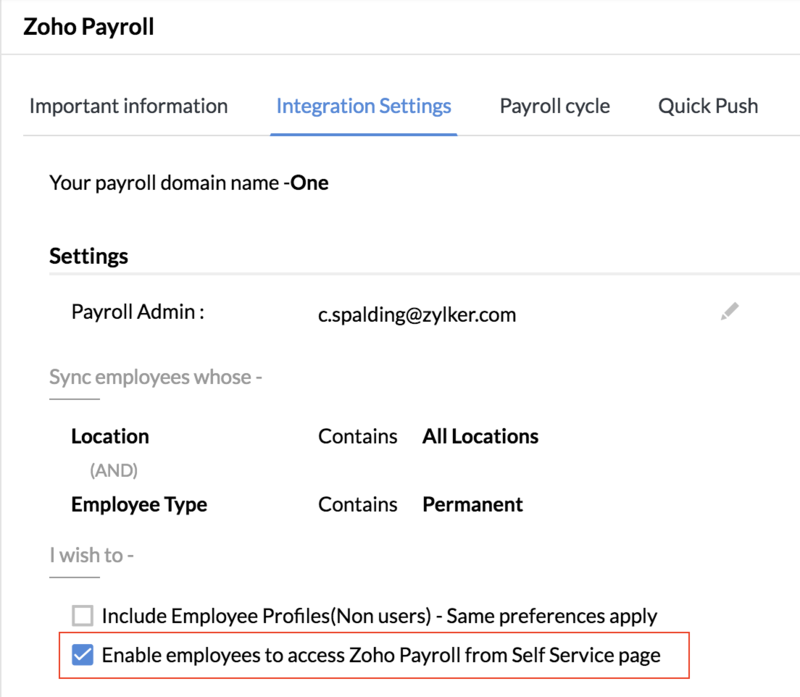 Under Integration Settings, select Enable employees to access Zoho Payroll from Self-Service page. 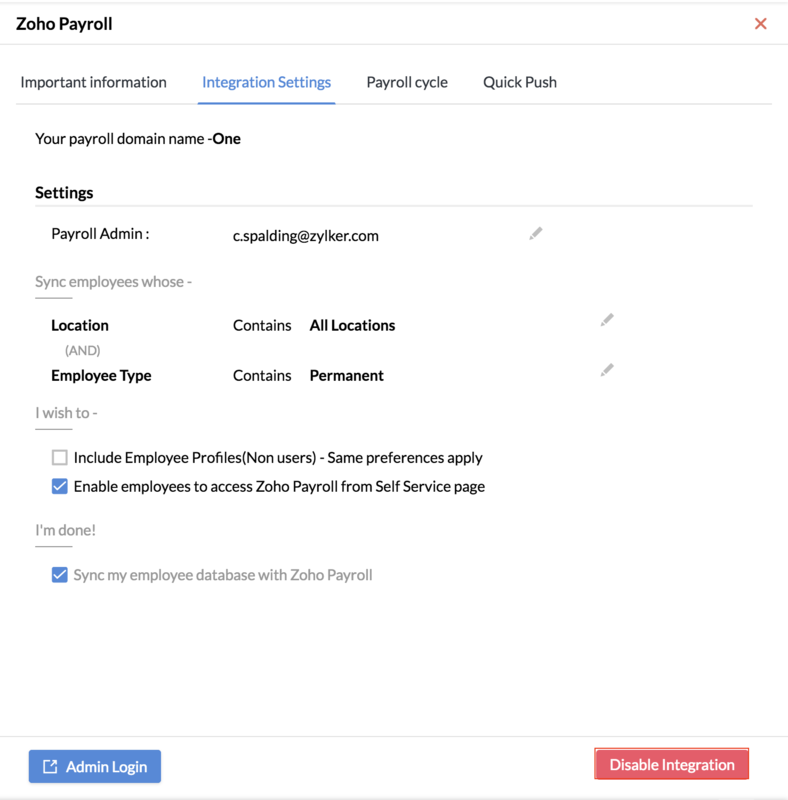 Once enabled, the employees can click the link to directly access Zoho Payroll from their Self -Service page. Select Disable Integration under any of the given tabs.